When the autumn time change happens, I always feel like my house gets smaller- by a few acres. The outside is my favorite room and I resent winter for taking it from me. And is it just me- or is every winter somehow a bit more twisted and confused than the one before? In the dark months, everything on the prairie seems the very definition of the dead of winter. It’s a monotone landscape, flat-cold, with not many trees to distract my sullen gaze. And just when three layers feels like enough, the wind kicks in like a boat-load of drunken pirates, cursing and careening across the farm, blowing off any hope the snow might have given for a green spring. The wind leaves a snow desert, frozen and parched. It makes us all itchy. This winter I had the added distraction of a frozen water hydrant in the barn, but just the last 6 weeks or so. Still, it isn’t like I had to haul buckets of water to the herd in the howling wind. I just had to drain the hose from the barn to the far side of the house in the howling wind. “The wind shows us how close to the edge we are.” ~Joan Didion. I know better than to listen to the weather guy, and calendars are out of touch with reality. It’s smarter to take a cue from the animals. Winter lingers, and our duck, Fred is lonely and sad. It’s his first winter without Ethel (read about it). He waddles out to the pond to check for a thaw, but returns to bathe in his half-frozen, duck-sized feed tub. He can hear the Canadian geese flying over. Then one day something strange happens- the sun feels warm on my back. Temps aren’t above freezing, but it has been so long since the sun gave up anything more than daylight. 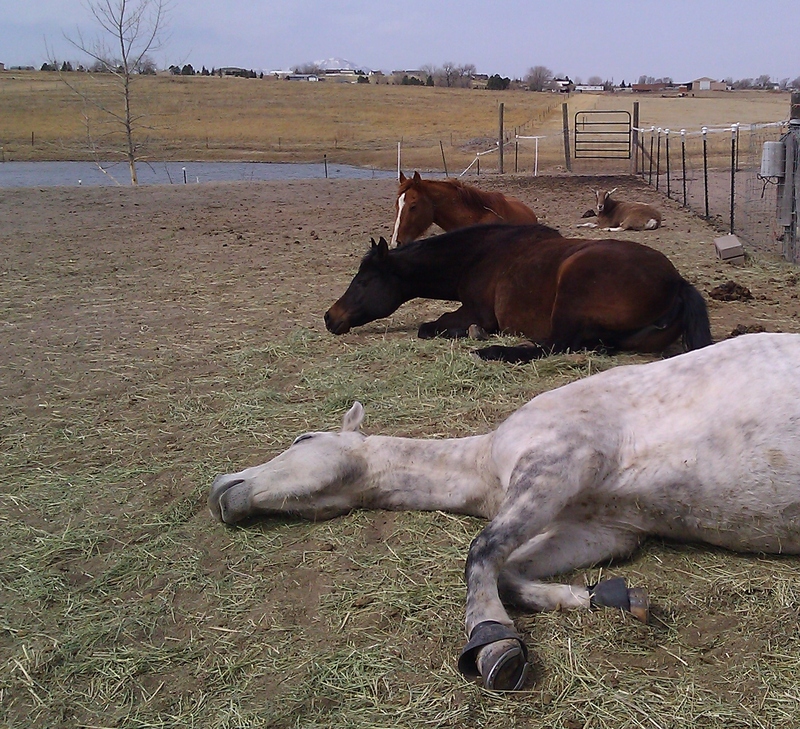 Instantly, every animal is flat on the ground like oiled-up sunbathers at the pool. The next week the temperature shoots all the way up to 37 degrees. The llama girls do an ancient ritual dance of -let’s call it love- with each other. That’s all I can say. An invasion of robins and mountain bluebirds followed. Then yesterday, the Grandfather Horse led a breakout. It is heart-stopping, literally, to watch a dead-lame horse lift himself up for his Annual Spring Canter. Will his legs hold him? The others followed and everybody got to run on tippy-toes and flag their tails. It didn’t last long, and the Grandfather led them all back into their pen for water soon enough. Still, his crime spree is an undeniable rite of Spring- even with a joint-aching hangover the next day. And finally– the barn hydrant thawed out. We all survived winter. It’s a miracle! Let the hose dragging stop and gimme back that hour of light! Hibernation’s over, this is Daylight Savings Saturday night. Yes! Spring! Thawed hydrant! Hooray! One of the only true signs there are! Ahh…you connected the dots for me. Hudson’s on his second jailbreak in our gorgeous (but soon to be rained upon) spring weather. Of course! Love the grandfather horse’s annual canter, and with you on the barometric horse. Lovely post. What a wonderful post! Your 4th paragraph reads like a Winter Prairie Poem. I love the description of the Old Horse, I could see him! Also, as always, I learn something new about all the majestic beasts you share your life with. Thank you! Poor Fred.